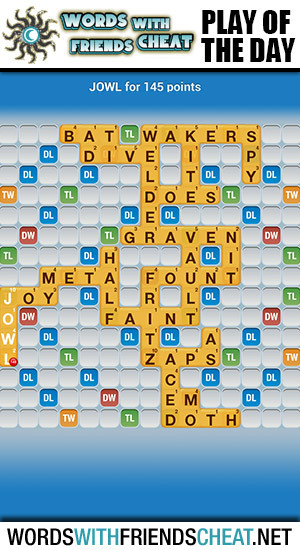 Today’s Words With Friends – Play Of The Day is JOWL (145pts) and was submitted by Words With Friends Cheat user Bill. There seems to be a theme emerging with Play Of The Day and that theme is the placing of high valued letters on triple letter tiles. This is how you win. If I could only give one piece of advice, it would be to play with strategy. Don’t just play the first word that finds its way into your head. Save up your high scoring tiles and your esses. See the board and be intentional in the way you place your letters. Today’s POD is a perfect example of what that strategy looks like.